Romanesco broccoli (also known as Roman cauliflower) belongs to the Brassicaceae family, it is a variety of Brassica oleracea and its scientific name is Brassica oleracea var. italica. Known and eaten since the days of ancient Rome, it looks rather like a cauliflower but is yellowy-green coloured and conical in shape. 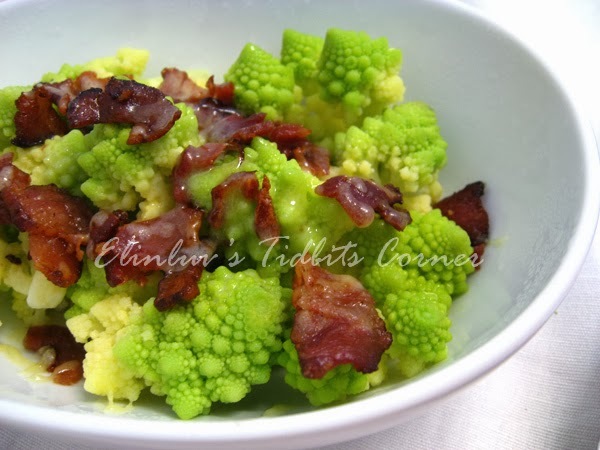 Romanesco broccoli is a biennial plant; it has a taproot from which a great number of secondary roots sprout, as does the stem, on which the straight leaves and head grow. The head is formed by a group of flowers (an inflorescence) and is the part normally eaten. 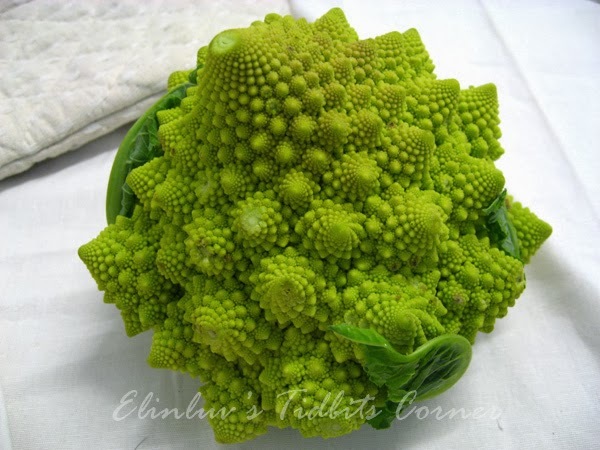 The inflorescence of Romanesco broccoli is amazing; in fact it represents a natural fractal, composed of a spiral group of rosettes that are, in turn, made up of spiral rosettes. I could not resist buying them when I saw them being sold at one of the supermarket. Bought one head which costs more than the normal broccoli. I paid RM 7 for one small head of Romanesco Broccoli. I like the spiral rosettes and the crunchy texture and as a vegetable its texture is far more crunchy and its flavor is not as assertive, being delicate and nutty . 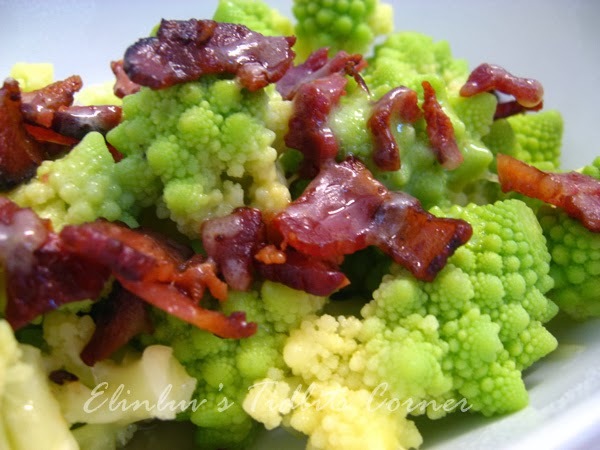 It has a striking appearance and is beautiful to look at :) I have some bacon chips in the freezer and I decided to make a simple side dish out of it. I fry the bacon chips till crispy so that there is no more fat on them ( healthier ) Mix the blanched broccoli together with the fried bacon chips and throw in some grated cheddar cheese on top. Baked them in preheated oven of 170C for ten minutes. Mmmmm the melted cheese adds flavor and taste to the romanesco broccoli. And you can guess how much I love this ...forget about the calories from the cheese and bacon! Eating in Moderation is still my motto where food is concern ! By the way, as a vegetable Romanesco Broccoli is rich in Vitamin C, Vitamin K , dietary fiber and carotenoids.